As you can see from the stories about Harvey and Ivan in the post on Attention and Leadership, the focus of a CEO and the organization quickly morphs into culture. But culture is even longer lasting than attention. An individual or an organization can decide to pay attention to something new or different. It is not easy to switch at first because our “attention synapses” have learned to focus the brain on certain things. However, it can change relatively quickly. Culture is another animal. Once in place, its effects can last for decades. The “buck stops” with leaders for creating, nurturing and altering the culture of their organization. The mechanism for setting the culture is clearly attention but, with culture, a leader has more levers to pull than with attention. The only way to alter the attention of an organization is really for the leader to adjust his or her own attention. Organizational culture can be molded in many ways, but always from the top. Have you ever seen a company with a great culture that was rotten at the top? If you can accept the argument in the previous chapters — that the Eight Great Goods work as priorities for whole nations — then the importance of the Eight Great in organizations should be much easier to fathom; after all, organizations are smaller, more focused, with a clear cut decision-making process. In December 2009, I surveyed 1000 Americans and 1000 Japanese about their Eight Greats. (I should note that part of the reason for this survey was exploratory: I was trying to categorize the Greatest Goods and there were only seven that I had identified then.) The choice of Japan and US for this initial international survey was a careful one. I’ve been designing and conducting cross-cultural surveys since I was a college student. In every international survey I’ve ever done, the Japanese are always at the opposite end of the results spectrum from the US. Consequently, I often start a series of international surveys with these two countries — then I know what the global extremes are likely to be. And, on this survey — as in all of those in the past — there were significant differences in results from country to country. Interestingly, on any survey or interview I’ve given on this question, respondents felt like they could answer the question quite easily. Usually they spend a lot less time on the question of Greatest Goods for their organizations than they do when trying to rank their own personal priorities. One of the important findings, but not surprising in a way, is that Life is rarely perceived by employees as the Greatest Good of their companies. In most business organizations, Growth is the greatest good. In both US and Japanese samples, Growth was king in the organization. There are three important observations from this chart. One is that because Belief is so high in the US compared to Japan, it skews the remainder of the less highly prioritized Goods. Individuality appears to be a higher Good in organizations in Japan than in the US, but without the effect of Belief, this would be less pronounced. The second fascinating difference is that Japanese organizations emphasize Life less than in the US by a two to one margin. This would seem to fly in the face of my argument that Japan is the most pro-life country on earth. But the difference is in the unit of analysis — nation versus organization. Japanese corporations are so controlled by national law on the issue of Life that they don’t have to pay much attention to it. Moreover, because Japanese law actually prosecutes corporations for employees dying on the job or being fired without cause, corporations are widely perceived as the “bad guy” on the issue of Life — to a much greater extent than in the US. And finally, the most important point of the chart is that Growth is by far the highest priority Good of nearly a majority of organizations in the US and Japan. This is not at all surprising given that the goal of business organizations in capitalist societies is to make money and get bigger. What is surprising is that more than 50% of the respondents didn’t see their organization’s greatest good as Growth — do note that about 15% of the respondents from each country held jobs in government or education and therefore would be less likely to see Growth as their organizational Greatest Good. In Japan Fairness and Society themselves are two big foci of organizations. In the US the emphases are really mixed. And, Joy is the top priority of a very small number of organizations in either country. One of the more interesting results of the survey is the strength of the tie between an individual’s own Greatest Goods and one’s perceived Greatest Goods of their organization. In my survey of people around the world, there is a strong, statistically significant relationship between the congruence of individual and organizational Eight Great priorities and job satisfaction. And, it is not just job satisfaction that is badly affected by a mismatch between personal and organizational 8Great priorities; satisfaction with community, leisure activities, and even family life are all thrown out of whack when personal priorities are significantly different from those that surround you at work everyday. The chart above requires a little explanation. I chose in this chart just to analyze the approximately 1000 American respondents to my survey. My hypothesis was that job satisfaction would be higher if there was a closer fit between an individual’s prioritization and the prioritization of their organization. What is represented in the chart is the point count difference between a respondent’s priorities ranking of each Good and their perceived ranking of the Goods for their organization. So for instance, if I think Joy is my greatest good, it would get a 1 ranking, and if I think my organization places Joy last, it would get an 8 ranking. The difference, or delta, is 7 points. I simply summed up the delta between personal ranking and organizational ranking for each of the Goods to come up with the My Ranking to Organizational Ranking Delta. In the United States, the average delta was 18.1. In the chart, I compare the deltas of those who are satisfied with various aspects of their lives to those who are dissatisfied with those aspects of their lives. My hypothesis that there is a big delta between personal and organizational Greatest Goods was confirmed — but even more interestingly, those who have priority differences with their organizations also find themselves less satisfied with their family, their community, their leisure lives and the success-level of their organization. One word of caution, because this was a survey, we don’t know what the organization’s actual prioritization was, all we were able to capture was an individual’s perception of those priorities. And there is a possibility that people who are disenchanted with their organization are likely to see the priorities of the firm quite different from their own. But the fact that there was no correlation between My-Org Delta and the respondent’s satisfaction with health, spirituality, or even personal financial success makes it harder to turn the causality in the other direction. The important point here is that there is a significant drop in satisfaction the greater the disparity between an individual’s priorities and those of their organization. I saw this link between individual and organizational priorities and satisfaction up close and personal a few years ago. At the time, I didn’t have the Eight Great Goods to guide me but, I naturally didn’t make my decision to take the job in Japan lightly: I’d been talking to the founder of the school for four years; there were six months of negotiation on the contract; and I had spoken to a dozen or so of the top people before I actually decided to take the job. You’d think I would have uncovered the basic seeds of incongruence during all of these conversations. And to some extent, and perhaps at some subconscious level, I knew something was not quite right for me; so, I made sure there was the one-year opt out clause in the contract. I was never able to pinpoint my discomfort, and ended up signing the contract. I’ve always been one who values Joy and learning in life. After that, I care about family members and organizations (Society) and Individuality. Economic success and even Life itself are farther down my priority list. I thought there was reasonable congruence between my 8Great and my new employers’: Most universities highly value learning for the Joy of learning — I assumed this was the case for this school as well. I was concerned that Japanese companies are loath to put Individuality above Society. While I’ve studied Japanese society my whole career, this worry had been a deterrent to my taking jobs in Japan in the past. But in this job decision, the man hiring me for this job — the founder and owner — was a self-avowed maverick who had left the big, bad Japanese corporate world to start something that would allow people to be themselves. My contract allowed me to set my own work hours and even my own place of work — I could work from home as often as I liked. I know that most organizations don’t put Joy as high on their priority list, but my new boss reveled in the fact that he left work every day at 5pm to go swimming with his children and spent a month or more every summer in Australia so his kids could learn to speak English. He even talked about the frequent parties that the company held. During the hiring process, one of my first interactions with my team was a raucous evening of drinking and laughing. I expected a lot of fun! Since the school was mostly for-profit, I expected that Growth would be important as well. It was rarely expressed in monetary terms in the meetings I attended before hiring on. But there was a clearly expressed goal — to be the best school in Asia in the next 10 years. And that, too, was an ambitious goal that fit with my own interests in trying to push limits and achieve greatness. So what could possibly go wrong in terms of a fit of my personal and the corporate Great8? Joy, Individuality, Society and Growth — there was a pretty complete fit! A few months into my new job I talked about my issues with it to friends. I usually tried to do this with some anecdotes, and I, naturally, expected my friends to be appalled by what my new employer was doing to me. Their response was baffling. They tried to look sympathetic but there was no true empathy. Even their questions felt like recommendations for me to try harder: “Isn’t this just a cultural issue?” “Maybe if you stick with it, you’ll find it isn’t so bad?” “Don’t a lot of Japanese companies work like that?” “Can’t you try to fit in better?” My anecdotes were not communicating my discomfort. I was unable to explain why the lack of fit that I was feeling was driving me to a place of real unhappiness. I didn’t have the words. Now I do. Now I even have a chart! For the sake of argument, let’s assume that Life is the Greatest good. I’m taking the job partly because I’d like to have the money to stay alive and my new employer would like me — and the other employees — to stay alive for obvious reasons. If we remove that Great Good from the comparison, my next six Goods (at this point in my evolution, I hadn’t yet included Stability in my conceptualization of the greatest Goods) were roughly in the following order: Joy, Society, Individuality, Fairness, Growth and Belief. Before I joined the organization, I expected my new Japanese employer to prioritize major decisions in approximately the following order: Growth, Individuality, Joy, Society, Fairness, and Belief. In other words, there was a respectable congruence — If I just add up the point differences between my personal order and my expected organizational order, I get a delta of a 10 point difference. One of the biggest differences that I expected was in Growth. I place a fairly low emphasis on acquiring more money or stuff. But, because I was going to work for an educational corporation — albeit a partially not-for-profit company — I was comfortable with a focus on revenue and growth. You would expect Growth to be the number one Good in many companies. 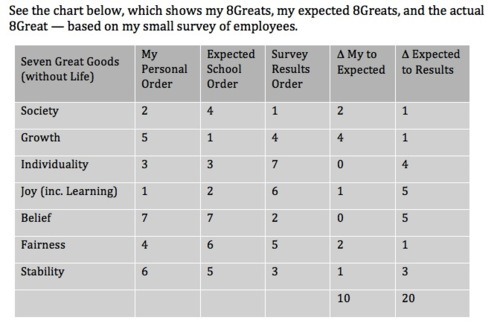 Almost a year after leaving the job, I asked seven people who worked at this university to rank the Greatest Goods there. If I had only had the wisdom to do a quick survey when I was interviewing for the job!!! Then, I would have known to ask an entirely different set of questions, and I probably would have decided to forgo the opportunity all together. My respondents — on average — thought that the 8Greats for the school were: Society, Belief, Stability, Growth, Fairness, Joy and Individuality. Can you see how different my own and my expectation of 8Greats are from the reality of the organization? No wonder I was generally unhappy in my job. When the Goods of an organization are that far from the ones that we personally profess, it is likely there will be some tension. And in this case, I was completely blindsided by a couple of the priorities. I really believed — based on everything that I was told — that Individuality was an important priority to the university. But in my-after-the-fact survey, the employees rated Individuality as dead last. And Belief came in first place!!! At a place like Notre Dame or Brigham Young University, I might expect Belief to be first place, but this was entirely unexpected. I actually had a sense that there was a religious affiliation to the university during my early interviews. I even asked the founder if he was part of some evangelical Buddhist sect. He denied having any affiliation or even any strong belief in religion. So, I was surprised to find, after I joined, that at many organization off-sites and gatherings, we were asked to read from Neo-Confucianist texts. In my interviews, the founder was technically correct to say that there was no “church affiliation,” but there was a very strong belief system. If I had just done this survey before I joined the organization, I would have armed myself with a broader set of questions during my due diligence period. Finally, it was significant that not even learning was a huge priority at this university. I came into the organization expecting a place where we could discuss how the individual employees could uniquely contribute to the future. I started right off proposing innovative new solutions to grow the school to become Asia’s Number One. But, I didn’t give proper obeisance to — nor did I even understand — the belief system in place, one that emphasized Japanese tradition, social cohesion and hierarchy. I was just in the wrong place and I felt it in every conversation I had and in every meeting I attended. 1) Ask your employees what they believe others in the organization perceive as the Great Goods. 2) Ask your most important customers and clients what they see as your Great Goods. 3) If these are different from what you would like to see as your Great Goods, what decisions and changes do you need to make to ensure that your culture is perceived as the culture you want to nurture?